Volunteers counted 39,814 birds of 108 species for the islands Christmas Bird Count, including one first: the Northern Mockingbird. The riverbank fell into the river as the tide fell — the whole place is changing. The entrance to North Beach is now just a few metres from the Hiellen, and the buffer of trees is gone. That didn’t deter the tiny Dipper from keeping on its appointed rounds. We hadn’t seen one all year so it was a treat. Offshore, all the birds we usually see in Dixon Entrance must have stayed in Hecate Strait. 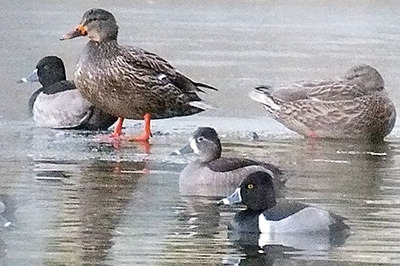 There were only a handful of ducks: 11 Black Scoters, two White-winged Scoters, and one Common Goldeneye. Loons were few: eight Common, six Pacific and seven Red-throated. Even though it was a calm day, the surf was huge. It rose like a wall, sharp and crystal before falling over itself and rushing onshore. Two Mallards came from somewhere and fled although 63 Surf Scoters showed how they got their name. At Yakan Point, two Harlequin Ducks dove in the rocky sea-rush and 10 Long-tailed Ducks kept on going. Sixteen Black Turnstones fed on the rocks, a Peregrine Falcon turned a tree into a totem and 58 Varied Thrushes rushed from the roadside. We were happy to hear the Virginia Rail again this year — it’s an elusive bird, sometimes heard but rarely seen. The day belonged to the Pelagic Cormorants. They swept in droves from faraway to create a raft in the ocean off Tow Hill. The flock got bigger as the day darkened, until we were counting shadows. The surf kept roaring and gulls rode the updraft as they headed offshore to roost. Total species for Rose Spit: 36. The Port Clements count was great, but freezing! The most amazing array of feathered songsters circled us all day. In a small clearing it felt like we’d fallen into bird heaven. Robins, thrushes, flickers, siskins and an Anna’s Hummingbird came out in the winter sun. In the park by St. Mark’s, another little haven of birds produced a flock of Dark-eyed Juncos feeding on seeds scattered on the icy ground and among them was the rarest bird of all: a Rustic Bunting. After 160 counts it was our first ever on a CBC! It fed quietly under a bench. 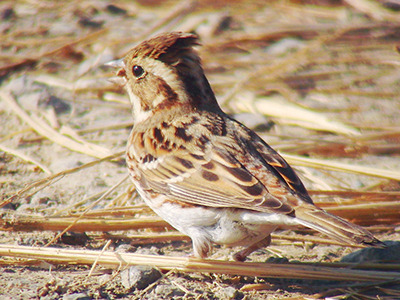 The Rustic Bunting nests in northeast Europe to northeast Russia and is seen rarely in Alaska. It’s also rare on the Aleutians and the Bering Sea islands, and very rare on the Pacific Coast to California. It was a sight for the ages. In the high trees a Townsend’s and Yellow-Rumped Warbler flitted and disappeared and a Ruby-crowned Kinglet joined the Golden-crowned Kinglets for a second. What a lovely, peaceful park it is! Down towards Kumdis Bay we found a small patch of open water in a partly frozen pond. We leaned out from the vehicle window to find a flock of 25 Ring-necked Ducks all preening quietly. Among them were a few Mallard and teal. Had we got out and slammed the vehicle door they’d have flown in a flash. In another quiet garden, two Lincoln’s Sparrows sat in a leafless bush while three White-crowned, three Golden Crowned and one White-throated Sparrow fed with the juncos. We watched them from a friend’s warm home and then, out in the cold world, 20 Trumpeter Swans fed in the Yakoun estuary. The road to Juskatla was an ice sheet a day earlier, but had been sanded so we got there and back safely. We found a few Killdeer sitting on a distant log and the only Eurasian Wigeon and Gadwall for the day. It didn’t rain at all. We felt the loss of our bird-friendly friend Sue Couch and how much she would have enjoyed being part of it all. With four down and two to go, it seemed like a very long count season. Then, the day before the Skidegate Inlet count, a photo arrived in our inbox. Yes, it was a Meadowlark, incredibly back after a three-year absence! We found one at Copper Bay on the 2013 CBC but it’s such an exceptionally rare find that we never thought one would show up again. Ronnie Stewart in Masset recorded the first one in the early 1950s. It’s a colourful bird with a bright yellow throat and black bib. Once seen, it can’t be mistaken for anything else. The day of the Skidegate Inlet count dawned with a rosy sunrise and a brisk wind that made for choppy seas. The Kwuna bounced through it, as did the boat ‘party’ braving the northeasters to find record numbers of Black Oystercatchers and 770 Western Grebes, those of the swan-like neck and dainty aspect. There were also 236 Red-necked Grebes, a high number for any winter — they seem to be staying longer than they used to. Brant geese numbers were down, we only saw seven for the day, but the 618 Canada Geese was a new high and in the mix was one dusky Snow, obviously a juvenile that hadn’t come into its bright white colours yet. Two tiny Anna’s Hummingbirds continue at feeders in Sandspit and mixed in with the nine Savanna Sparrows was one lone Orange-crowned Warbler, tricky to identify in winter colours. Three Lapland Longspurs swung through the bright air and Robins put in a record appearance. Over 100 were seen on count day. They have appeared all over the island this winter — the cold north has driven them down. Shorebirds were many: Sanderlings, Surfbirds, Dunlin, Turnstones, Rock Sandpipers, Killdeer and Black-bellied Plovers were all recorded, but the bird of the day was a Northern Mockingbird, the first ever seen in 163 counts over 35 years! Total species: 72. We had the most participants of any community for the counts. Through wind, rain, sleet, and snow, everyone gave it their best shot. A hint of sunshine for a brief flash, but it was a raw southwesterly day. Even the birds felt it. The youngest birder, Nora Jane, wrote that she saw “birds on a rain-e day” and listed seagull, eagle, two sparrows, one loon, 10 ducks, three cormorants and one hummingbird. We’ll have to talk about the latter, but she pretty much captured the sense of the day. Visibility was low — a flock of 10 Canada Geese sifted through the sleet like shadows. Were they real or not? The two Trumpeter Swans that landed in Delkatla at the end of the day were — Tim had seen them earlier — and so were the 1,000 Green-winged Teal hunkered along the tidal edge when the tide fell. Thousands of birds fed on the wracks at Skonun Point with hundreds of shorebirds. But everyone held it together, especially since, among the shorebirds, one Rock Sandpiper was added to the growing species list and two surprising Ring-billed and two Glaucous Gulls mixed with the Glaucous-winged Gulls. At Entry Point, a Marbled Murrelet, four Pigeon Guillemots and a lone Horned Grebe sat out the falling tide, and out over the Seaplane Spit eight Least Sandpipers circled and landed. Back in the sanctuary, a Peregrine Falcon shouted around as it sparred with a young eagle and we only had two kingfishers for the day. We rushed to join him and Peter identified the very beautiful, bright yellow Wilson’s Warbler high in the trees with kinglets. It was a cheerful end to a very chilly day. Friend Cacilia reported that she had seen “hundreds and hundreds and hundreds of ducks, hundreds of gulls, four Bald Eagles, 52 crows and one heron in front of her home. There were too many to count. It was a great day. Further down Hecate Strait were 1,672 Common Goldeneyes; 3,716 Pacific Loons; 105 Red-throated Loons; and 159 Pelagic Cormorants. And those were only the ones we could see! It was one of those perfectly calm days on Hecate Strait where you could see for miles and the birds flew by in streams. We roamed the highway stopping at places where the ocean was visible and counted until darkness descended. We had never seen so many Pacific Loons in all the 35 years of the counts. We don’t usually see many Great Blue Herons on this count, but this year we had 11. So where did all the birds come from and why were they here? Well, according to fishermen friends, birds have their own weather station. The winds, tides and currents tell them when its time to move and the weather turned on the day of the count. From the chilly north-northeast winds of the previous two weeks, they veered south-southeast and the birds knew it. It was time to get their feathers in flight mode and go to feeding grounds elsewhere. We can only scratch the surface with this report but can’t leave without mentioning the 10 Trumpeter Swans resting peacefully in Noel and Barbara’s garden. They have become part of the family. Throughout the islands we found 108 bird species — 39,814 individuals and one new species, the Northern Mockingbird. An exciting season indeed.